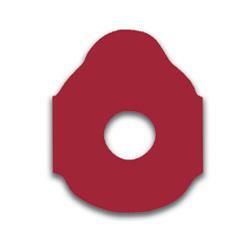 The Crimson King Blocking Pad are designed to perform on today's "slick" top coatings. The Crimson King's unique adhesive works great on all lenses and coatings, bonds securely and yet removes cleanly with no residue. The Blocking Pad's tough rubber defies tearing and will not twist or turn during edging. Try the Crimson King today!